A 4-acre, integrated, organic farm featuring vegetables, fruits, herbs, chickens, and fish. 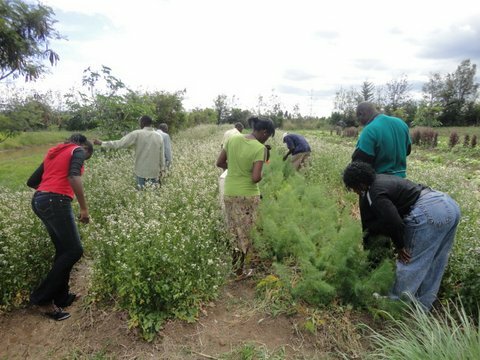 We strive to design our farm to work with the surrounding environment rather than against it, thus creating a model that can be duplicated throughout Kenya bringing safe and healthy food to the ones in need. MOOF AFRICA recognizes the need for economic stability to be spread throughout Kenya, and Africa at large, therefore we have created an economically viable model to surface as an example and learning center. Ecological farming must be socially responsible, economically viable, and environmentally friendly. Our farm works against climate change rather than contributing to it. This is our global vision. Lettuce (7 varieties), Carrots, Tomatoes, Kale, Cabbage, Leeks, Spring Onions, Beets, Comfrey, Chili, Geranium, Mint, Peppermint, Chives, Horseradish, Strawberries, Garlic, Irish Potatoes, Sweet Potatoes, French Beans, Sugar Snaps, Snow Peas, Basil, Fennel, Celery, Cucumbers, Cauliflower, Green Beans, Corn, Zucchini, Squash, Pumpkins, Passion Fruits, Avocados, Guava, Bananas, Sugar Cane, and more……..
How to mix home made prepared rooting/growing media mixes. MoofAfrica.com Website is now online!